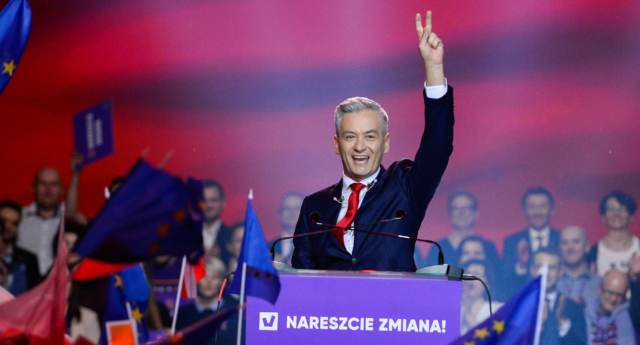 Poland’s first openly gay politician has launched a new progressive, pro-European Union political party called Spring. Robert Biedron, the former mayor of the town of Slupsk, hopes to challenge the ruling right-wing Law and Justice party, as the country prepares for both domestic and European elections this year. Speaking at a rally in the capital Warsaw, Biedron said: “In recent years we had a really tough choice. On one hand we had the politics of statistics and economical indicators. “On the other hand, we had a grotesque caricature of democracy, with constitutional breaches, limitations on women’s rights, and propaganda instead of public media. “We are the spring, we bring in fresh air to Polish politics,” he added. The 42-year-old former mayor has vowed to introduce the recognition of gay partnerships, equal pay for women and better access to abortion and reproductive rights, as well as universal old age pension. He also promised to shift politics away from the church, which holds significant influence over the deeply Catholic country. Biedron also pledged to unite the country after the public murder of the liberal mayor of Gdansk Pawel Adamowicz in January, which raised questions over rising hate speech. The Spring party will run in May elections to the European Parliament and Poland’s general election later this year. On Biedron’s website, he describes himself as someone who is “often swimming against the tide” who can “unite” people. He wrote: “I am a politician who loves Poland, who is focused on the sustainable development of a modern honest state that provides equal opportunities for all, supporting education and culture, ensuring security and development. He also launched Poland’s Campaign Against Homophobia, and in 2011 became the first openly gay MP for the Gdynia-Slupsk constituency.